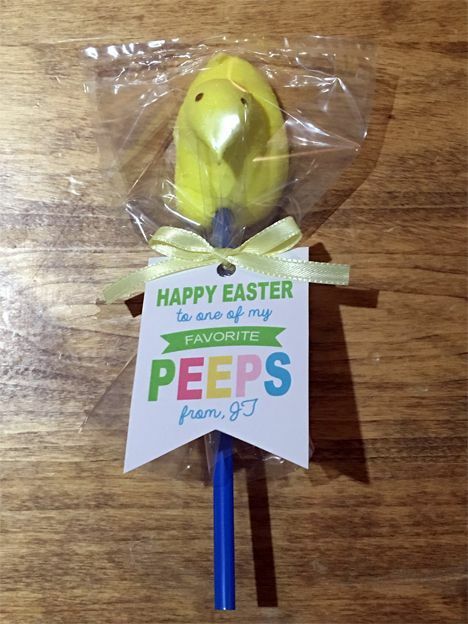 My son loves to give gifts to his classmates so I made this cute Easter Peeps gift/tag for his class party. If you like marshmallows this is a great inexpensive gift to make for others! All you need is a couple packages of Peeps ($1 for a 10 pack of Peeps), 1 box of neon straws (under $2), a package of clear party favor bags ($3), and one roll of thin ribbon ($1.50). If you need a custom tag for your next class party gift or for any event, contact Paper Perfection at jtanddolly@yahoo.com for pricing and details.